After having tested the Billie jacket, I’m back with the Suùn blouse by pm-patterns. 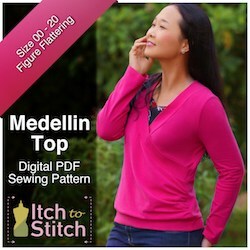 This is a versatile pattern since you can sew a blouse or a dress with 3 necklines and 2 sleeve lengths. I chose to sew two blouses to test the sleeve lengths (and I’m not a big fan of dresses!). The pattern is available as a paper pattern or as a PDF. The PDF version contains a A4 file (print-at-home) or a A0 file (copyshop). 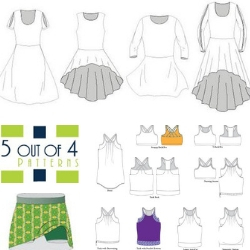 As said earlier, the pattern offers a blouse or a dress version. The latter can be sewn as a knee-length dress or as a maxi dress . It is really easy to transfer the pattern or to print it. The design is refined, with small and exquisite details such a as gathers along the shoulder line, a yoke at the back and a faced V-neck with 3 depths (from modest to deep-plunging!). I tested the long sleeve version of the blouse first (because I just don’t like my upper arms…). The fabric comes from Les Coupons de Saint Pierre (but it has been retired since the golden foxes washed away). The fit was spot-on (I tested a straight size 42). On this unaltered version, the neckline was really (really really!) low. Karine then adjusted it and now offers 3 depths: modest, low-cut, and deep-plunging. That’s great because you can now adapt the pattern to the occasion. The second Suùn blouse (with modified depth) was sewn as a short sleeve top. I behaved as a bad tester on this one since I used the burrito method to sew the yoke lining (I should have used the hand-sewn method as stated in the instructions…!!!). I juts hate hand-sewing, because I’m not really good at that. EDIT: I did a tutorial on how to sew the yoke lining with the burrito technique. Have a look here!